Welcome to December Daily® 2014 | Day Twelve. I've been looking forward to this day and being able to play with this die cut chipboard page. 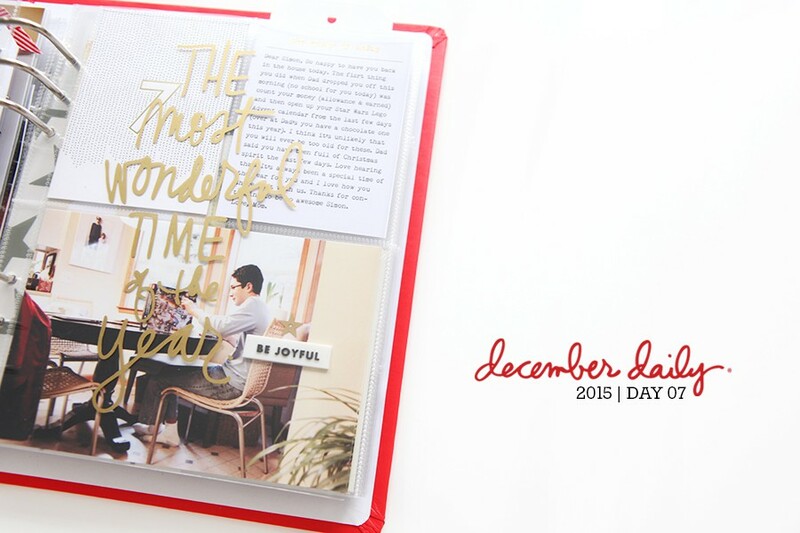 In past December Daily® albums I've done a lot of mixing in different textures and page sizes. I really do love having a mixture of page protectors + things outside of the pockets such as photos adhered back to back, artwork, unique sizes, etc. They just add interest and they are fun to put together. Day Twelve is a combination of two photos adhered back to back (photos of my kids notes to Santa) and the full page die-cut chipboard. Last night the kids wrote their letters to Santa. I gave them each a zig zag edge card and away they went. I took photos of each one and then printed them and adhered them back to back. At the bottom of each photo (you can see Simon's note below) I added a glitter heart and their initials (letter stickers). Holes were punched to fit the album rings. The die cut chipboard page is really purely just for fun. Most of the embellishments I included here are from the kit. In addition I added some gold star rub ons from Jenni Bowlin and a small pink chipboard letter "e." The gold rub ons were added to thick pieces of transparency that were glued to the back of the chipboard. When I put my foundation pages together I painted the front side of the die cut chipboard with cream paint. When it came time to put the page together I cut a piece of cardstock to the same size and then choose three of the circles to trace and then cut out so I would be able to see through to the next page. I actually ended up cutting two pieces of cardstock. The first one became the back for the embellishments. The second piece of cardstock is to use as a template when I print out a full page photo for Day Thirteen and want to cut holes in the photo to match (to maintain the see-through part). Above you can see the holes after I first cut them. After I traced the second piece of cardstock I ended up cutting more around the edges of the circles of the white cardstock so you don't see any of the outer edge of the circles. I also added the star border using red Staz On ink and stamps from the kit. On the back you can see the transparent pieces with the star rub ons. I just adhered those pieces to the back of the chipboard. I centered the Santa letters in the middle of the rings. Above you can see what I have for Day Thirteen right now. I plan to print out an enlarged photo and cut three circles in the photo so the see through elements will keep that quality. I'd love to have you share a link to your Day Twelve pages below. Please link directly to your post vs. a general blog link. Teddies with tutus and Harry Potter gear... dying with cuteness overload! Love pages purely for visual pleasure... it is Christmastime after all. Absolutely beautiful ! Love the chipboard page you have done - looks so pretty. I had absolutely NO idea what could be done with that chipboard piece. I am so thankful you post how you are using and creating with the different things in the kit. This is my first time using transparencies and chipboard, so I am really glad for the daily posts. I love that holey chipboard page! I can't wait to play with mine - I plan on using mine to list out my fav Christmas songs and use some of the great music elements you included in the kit! Oh I hope you share what you do, it sounds very creative and fun! I don't have the kit, so I wasn't aware of this "holey" piece of chipboard, but I may just make myself one -- I was thinking of favorite recipes/baked goods when I saw it, not sure if I can work in the see through idea though. 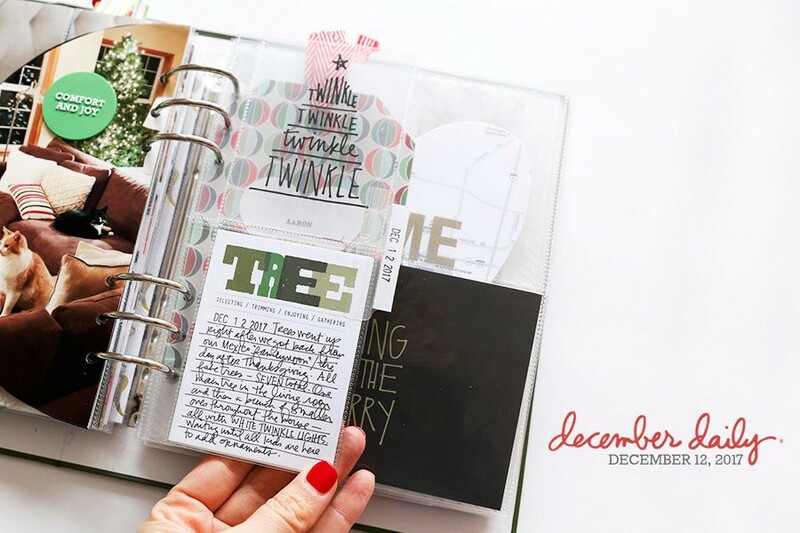 On the other hand, with no little people anymore, mine is more on the Journal Your Christmas end of things anyway -- I love the home cut style of the holes too! Lovely! Such a great idea, thank you for the inspiration! That chipboard piece is awesome. I just love it. Santa Letters are the best! The little-kid handwriting; their toy wishes of the moment. 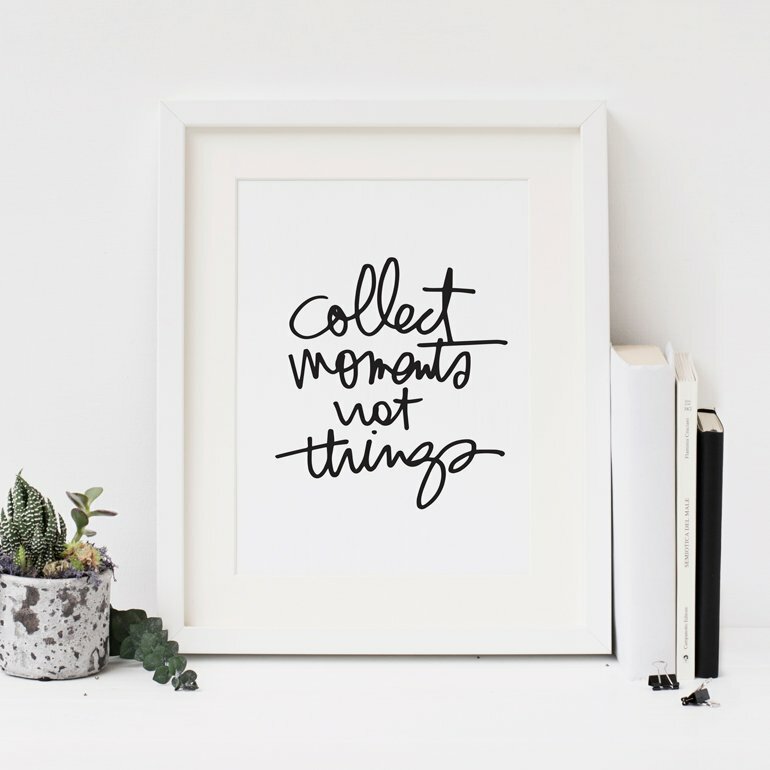 What cute memorabilia to keep! And the chipboard page with holes? Awesome! I get the feeling this foundation day wasn't like yesterday and that you jumped right in having fun figuring out what to do! Your ideas rock! I embossed my chipboard page. Gold glitter on one side and Ivory Frantage on the back. 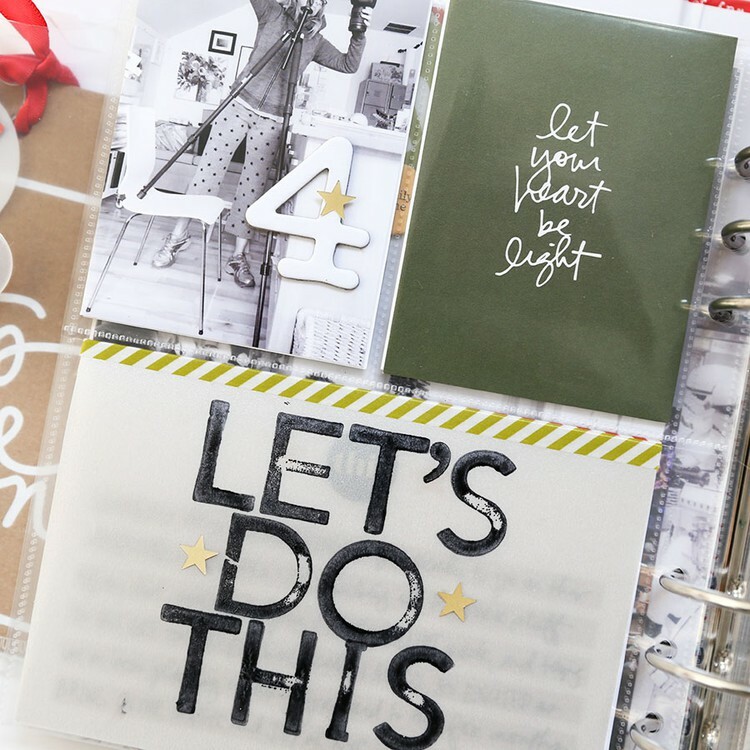 Then I cut two pieces of thick transparencies and glued one to the front using Glossy Accents, making it into a shaker page, using differnt types of small embellishments. Finished it off by gluing the second transparency on the back and punshing holes. Great idea, I want to try this! I am SO giggling over The Clue request. I adore how their letters tell us exactly who they are right now and what stage they are in. And...the chipboard design...beautiful, smart, inspiring. All that. Yep. He's been totally into the movie and the two of them actually "play" it in the house. At Thanksgiving he played the board game and then set up a bunch of lego guys to be the characters. Great use of that chipboard page! Looking forward to seeing it all come together with the enlarged photo tomorrow. Love this idea -- exactly what I've done! Not only no more little ones, but we're down-sizing/simplifying so we don't need much -- a book of poetry and of course anything Bruce -- thank goodness he came out with the new release this year! question. i'm having a hard time using the stamps. how/what do i stick them to? LOVE your collage! Thanks so much for sharing! Hi Ali! Have you ever thought of adding an image or link gallery specific to the product used? I would love to see how other artists used this chipboard (and some of the other more unique items in the kit), regardless of what day they used it! 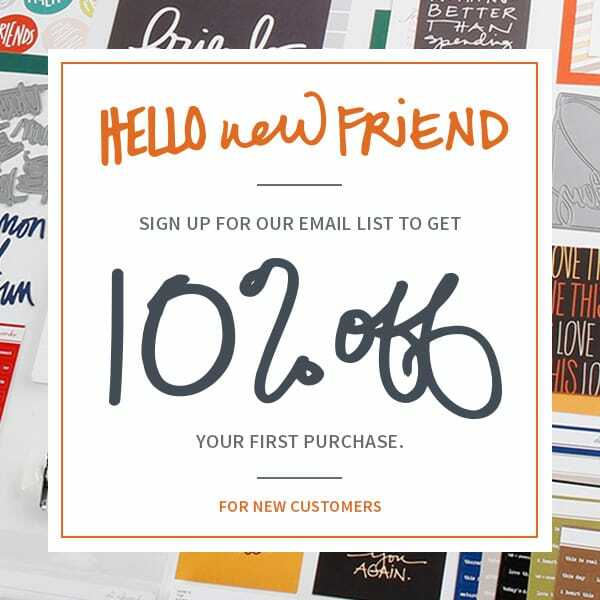 Maybe as your store continues to offer more products the link to purchase could be there too. Thanks for your daily inspiration!